A series of video clips have been released to the media over the past few weeks showing incidences of Kano state’s incumbent Governor, Abdullahi Ganduje making illicit deals involving the collection of bribes for projects within the state. Nigerians have now called for the resignation of Governor Abdullahi Ganduje following another fresh video where he was allegedly collecting bribe from a contractor. The two minutes, twenty seconds video clip dated January 18, 2017, which was posted online yesterday, exposed the contractors, projects and voice of the person rendering the bribe to the governor who was dressed in a black kaftan. Thus, prompting the request for the governor to step down. This new bribery allegation caught on tape emerged just barely a month after two similar videos were uploaded on an online news platform where the governor was shown collecting bribes in dollars and stuffing the cash into his white babariga. He, however, denied the allegation, saying the videos were photoshopped and thus fake. However, it is unusual for a series of video clips showing different incidents of the governor accepting bribes to all be photoshopped to spite him. As a result of this scandal which has become too much to ignore the governor has been called on to either resign or risk an impeachment charged by the Kano State House of Assembly, Economic and Financial Crimes Commission (EFCC) and President Muhammadu Buhari, who have all been called on to investigate the governor to serve as a warning to others condoning bribery. Perhaps, it is time for the governor to peacefully relieve himself from office before his current situation tarnishes his image further. The Olatorera Consultancy brand has grown from an ambitious solo-preneur to a team of over 50 people highly assertive on providing the seal and stamp of “Africa’s Best” to great businesses in Africa and beyond. 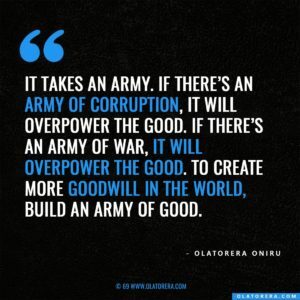 Chief Executive Consultant, Olatorera Oniru is very passionate about seeing businesses succeed and operate optimally. She is also notably passionate about witnessing Africa transformed into one of the world’s greatest continents. Olatorera Consultancy has an annual outline of businesses we work with. We currently do not accept unsolicited applications. To network with the team at Olatorera Consultancy Limited, please add your company to the reviews page here. An Olatorera Consultancy company representative may be in touch with you shortly after reviewing your company’s readiness for business consultation services. Who Owns Famfa Towers, West Africa’s Most Expensive Building And Where Is It Located? Moguls In Nigeria: Where Is Hakeem Belo Osagie? Osun Elections 2018: Did Omisore Kill Bola Ige? Who Is Abdelaziz Bouteflika of Algeria?